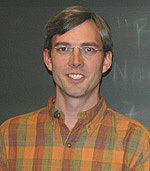 James Whitehead, associate professor of computer science. Photo by B. Grayson. A gift from Microsoft to the University of California, Santa Cruz, will enable computer science students to spend more time on computer games--developing computer games, that is, not necessarily playing them. Teaching students how to program computer games early in the curriculum is a good way to get them interested in computer science and keep them engaged, according to James Whitehead, associate professor of computer science at UCSC. Whitehead and Charles McDowell, professor of computer science, are leading the effort to increase the amount of computer game programming taught to undergraduates. The $80,000 gift from Microsoft will enable beginning computer science students to start doing computer game programming in an entry-level course, and will establish an optional game-programming project in a general education course. "Our concern was that the current projects might not be as interesting to the students as game projects, or that they might not see the relevance," Whitehead said. "The game component might get them excited about computer science and keep them involved." Whitehead was instrumental in establishing UCSC's new major in computer game design, one of the few such majors in the country. Since its inception in July 2006, both the major and its course work have been extremely popular with students. According to McDowell, student applications to study computer science at UCSC have risen from around 350 to almost 600 since the creation of the new major. Foundations of Interactive Game Design, the general education course that will benefit from the Microsoft gift, is popular with students from a wide range of majors--213 students enrolled in the class this quarter. The course already incorporates a project in which students create a simple computer game, but they've been using a computer program that allows them to create a game without having to know any programming. "I found there's always 10 to 15 percent of the people in the class who are interested in doing something more programming-heavy," Whitehead said. The gift will allow those students to do just that. Several sections of the class will program a game by writing raw code, while others will continue to use the software interface. In the beginning computer science class, Introduction to Programming, the instructors will replace an existing quarter-long project with one incorporating computer game programming. Students will create a virtual pet, similar to a Tamagotchi or Animal Crossing character, that will be able to interact with its virtual environment and with other students' virtual pets. In both classes, students will be able to choose whether they want to participate in the computer game programming or the more traditional sections of the course. Whitehead said he hopes the more intensive computer game experience will encourage students to stay in computer science or to transfer into the major. Faculty will compare the sections of each course and assess how well the programming projects educated students and encouraged them to remain involved with computer science. "The goal of the gift from Microsoft is to help pay for the development and assessment of these projects," Whitehead said. The researchers plan to summarize their results in an article and publish them for other computer science educators. The Microsoft gift is evidence of how quickly Santa Cruz's computer game design program has grown, according to Whitehead. "It's a really strong endorsement of our program," he said. "In essentially two years, we were able to go from having no presence in this area to having the kind of presence that enabled us to get this gift."